The air-conditioning system in your car, truck or van isn’t something that you want to take any chances with, especially in a climate like that of Western Australia with our scorching hot summer that can be punishing without an efficiently working air-conditioning system to keep you cool when you’re behind the wheel. To keep your car cool in summer and warm in winter, your vehicle’s air-conditioning system needs to be professionally serviced, maintained and repaired by an ARC licenced air-conditioning specialist to keep it in optimal working condition throughout the year and keep you cool and comfortable. If you’re in need of a specialist to assist you with auto air-conditioning in Perth, look no further than Chamberlain’s. Chamberlain’s Auto Electrics provides car air-conditioning services in Perth and right across regional West Australia. An industry-leading business with more than thirty years’ experience, our team of air-conditioning experts are here to assist you with a premium service that’s sure to tick all your boxes. 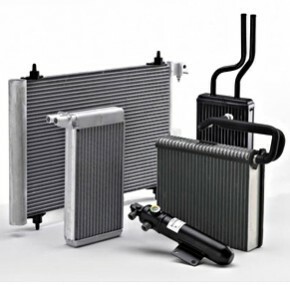 In addition to automotive air-conditioning repairs, maintenance and servicing, including our air-conditioning regas service, we also stock a wide range of high-quality air-conditioning spare parts from leading brands at our Welshpool showroom which is located alongside our modern workshop. Chamberlain’s Auto Electrics is a member of the Australian Refrigeration Council (ARC) and all our automotive air-conditioning professionals are experienced, qualified and ARC licenced. If you’re looking for a premium car air-conditioning service in Perth, give the Chamberlain’s team a call today. Whether you’re currently experiencing a problem with your air-conditioning system and require repairs and replacement parts or you’re looking at booking your vehicle in for preventative air- conditioning maintenance to keep it in optimal working condition, Chamberlain’s is here to assist you. In addition to being an industry-leader among local car air-conditioning companies across the city and surrounds, we’re also leading the way in the provision of truck air-conditioning services in Perth. Call Chamberlain’s today to speak to one of our friendly automotive air-conditioning experts. Regular automotive air-conditioning maintenance is an essential service that’s in your car’s service plan, so please don’t hesitate to give Chamberlain’s Auto Electrics a call today to learn more about our maintenance services and book your car in for a premium-quality car air-conditioning service. As vehicles tend to lose approximately 10% of the gas in their air-conditioning systems annually, it’s crucially important that this refrigerant is topped up every 18 – 24 months (every 20 months is ideal) to enable the system to continue working at maximum capacity and keep you and your passengers cool and comfortable. While there are DIY regas kits available for purchase, this is an aspect of air-conditioning maintenance that’s best left to a professional, plus when we top up the refrigerant we also inspect and clean the entire unit to ensure it’s working efficiently and fix any potential risks. At Chamberlain Auto Electrics, we believe in following the car manufacturers’ recommendations which is why we only use R134a replacement refrigerant when suited for your vehicle as this most beneficial for you’re a/c system. Non-flammable R134a is the refrigerant of choice among vehicle manufacturers across the world, it’s used for all new cars, and has received millions of hours of in-service testing in all climates to ensure it performs. Our auto air-conditioning pros firmly believe that top air-conditioning products together with skilful, trained individuals and wide-ranging field experience will provide a first-class service every time, so you can rest assured that your car, truck , earthmoving equipment or van are in safe hands when you bring it to Chamberlain’s Auto Electrics to have it repaired, serviced or maintained. While the premium car air conditioning service we provide for Perth vehicle owners, both commercial and private, is mostly managed at our well-equipped Welshpool workshop on Harris Street, we understand that sometimes it might not be convenient for clients to bring their cars, trucks or vans to us, which is why we also provide a mobile air-conditioning service where possible. Chamberlain’s Auto Electrics has a fleet of well-equipped vans manned by uniformed air-conditioning experts who can come to your home or place of work and carry out a wide range of professional automotive air-conditioning services, including repairs, maintenance, servicing and regas services. Fleet support services are also available on request, so if you’re a local business owner with a fleet of cars, trucks or vans that require regular air-conditioning maintenance services to keep them working efficiently and reduce your overall operating costs by minimising the need for repairs, this is something that we can help you with. We work with many local businesses and companies across Perth and welcome the opportunity to help you maintain a more efficient business vehicle fleet. If you live in Perth or the surrounding areas and wish to take advantage of the convenience our mobile air-conditioning service provides, please give us a call and we’ll arrange a suitable time for us to meet you at home or at work. The Chamberlain’s Auto Electrics team looks forward to assisting you with all your automotive air-conditioning needs, so give us a call Stewart today – (08) 9362 6772.